In this time of play-offs, it’s good sometimes to take a step back and remember the only competition that really matters–which ethnicity is best (not that it’s much of a competition). 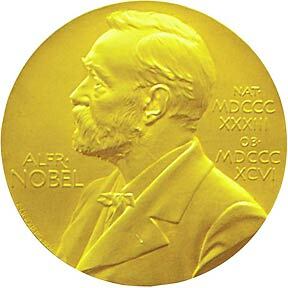 The Nobels are being announced, and the Tribe has hit the Trifecta–Medicine, Chemistry and Physics. For Medicine, we’ve got Ralph Steinman and Bruce Beutler (court is still out on Jules Hoffman, but we’ve got our suspicions). In Physics, we’ve got Saul Perlmutter and Adam Riess (who generously allowed Brian Schmidt to share in the wealth), and in Chemistry, we’ve got a twofer–Dan Schechtman, who not only is member of the Tribe, but an Israeli to boot. Even if the Chosen don’t pick up Economics (some Swedish guy won the Literature Prize, and we’ve already decided that Bibi isn’t bringing home the Peace Prize), we think it fair to say that the Jews are going to Disneyworld.